Donatella Versace loves New York. She’ll tell you herself, but now there’s a Versace T-shirt that spells it out, too, combining the Medusa logo and Milton Glaser’s iconic “I Love NY” state logo on a see-now-buy-now souvenir from the house’s inaugural pre-fall show, staged where else but Manhattan. Years ago, Versace held a Versus show in New York, and in 2011, the Versace x H&M show at which Prince performed was also held in town. 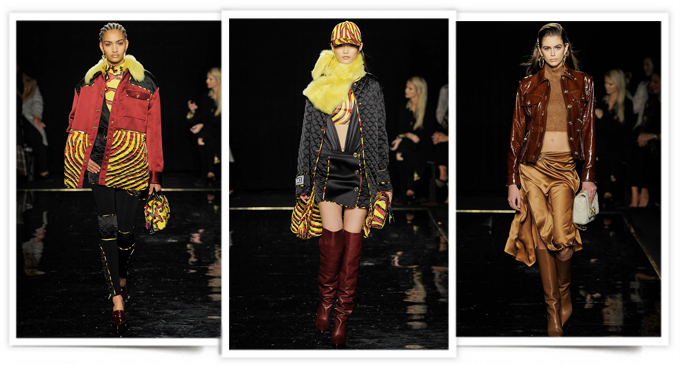 But she pointed out that Sunday night’s show was the first time there was a real deal Versace show in New York. She said there was symbolism to the date — Dec. 2, Gianni Versace’s birthday — but not the venue the American Stock Exchange. “It’s not a reference to Capri Holdings,” Versace said during a preview at the company’s Columbus Circle offices a few days before the show, alluding to September’s $2.1 billion acquisition of Versace by Michael Kors Holdings, which resulted in a new name for the parent company. This entry was posted in BREAKING MODE, BREAKING NEWS, FASHION WEEK PARIS 2018 by admin. Bookmark the permalink.